Maybe it's too early to be asking this, but can anyone speculate on how long these cameras will run using the stock Canon batteries? What battery options will work if you want longer run times? 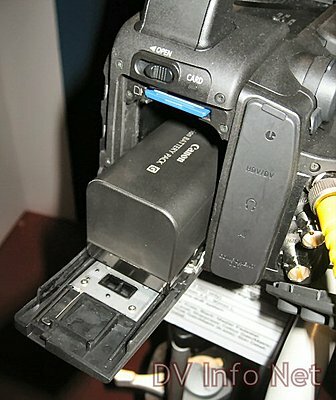 Canon USA told me to expect about seven hours from a BP-970G, the most powerful battery they currently have. Either camera ships with a BP-950G, good for about five hours. Based on that info, power consumption seems to be about the same as the XL H1. Oh I'm used to it. I had a zipper and a padlock installed on my kisser years ago. Forgive me for being blind, but where will be battery connect to the cameras? The rear views show a covered backend, is that a door or something? Edit: just noticed the "hidden battery" feature in the press release. Last edited by Tom Vandas; July 27th, 2006 at 04:16 AM. I looked at the pictures and seached for an answer but I just don't see where the battery goes or is they nuclear powered. Thanks Chris. I missed that part where the battery in on the inside of the camera via a battery door on the back. Love the ideat that the batteries on the A1/G1 are stored internally, especially during bitter cold NY winter days. But, does this affect the ability to make longer lasting batteries? For example, the higher capacity BP-945 for the XL-H1 is physically a much larger battery. I see Canon has two new battery offerings for the XH series: the BP-950G and BP-970G, but, there are no details yet. Here's what's behind the battery compartment door. The BP-950G has been pulled halfway out. The larger BP-970G fits easily. Note the SD card slot just above. My pic but sadly not my cam.